Hail! All poseurs must die! German speed metal rules! 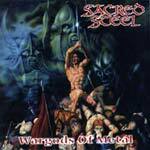 Sacred Steel's sound derives from mid-eighties speed metal. Remember a time before Fates Warning was considered progressive metal and before Helloween was considered melodic metal? Well, cross Helloween's "Walls Of Jericho", Fates Warning's "Night on Brocken" with early Virgin Steele and Agent Steel and you get the picture. Lyrically, Manowar have got to be Sacred Steel's biggest influence. I mean, these guys must read Manowar lyrics like they were the Bible. Just check out the song titles: "Metal Reigns Supreme," "Sacred Steel," "Sword Of The King," "True Force Of Iron Glory", etc. I suppose that critical reviews would say that these guys are reliving the past when they should be striving for something fresh in the future, but I'm not complaining. As a matter of fact, I say more power to 'em. Raise the flag of metal for heavy metal still reigns supreme! Oh damn, now I sound like a disciple from the church of Manowar. The second chapter in the epic tale of metal conquests and such. Putting Manowar to shame with their dedication to metal and their themes or all things heavy metal. Really there isn't a song on this disc that doesn't deal with the conquests of heavy metal. The music is fast and furious, the solos shred, the drums are pummelling and the lyrics are over-the-top ridiculous. While I have no doubt that this band is serious in their dedication to true heavy metal, their lyrics are obviously tongue-in-cheek and not to be taken seriously. As stated in my previous review, "these guys must read Manowar lyrics like they were the Bible." As usual, most negative criticism with this band falls with their singer's unique sound and style. Personally, I like him. If nothing else, he is quite a bit different from the lot of power metal singers and has an interesting way of ennunciating certain syllables and words. Overall, as with the band's debut, I enjoy the bands enthusiasm, their metal attitude and their overall style. Sacred Steel sound like Hammerfall and Manowar. The whole vibe of this disc is, "posers will die, heavy metal rules!" I don't have a problem with that necessarily, but it is a bit cliché. The music is uncanny to that of Hammerfall, but without the ballads. Still, despite the comparisons, I really liked this disc. I'm glad there are more new bands that are raising the heavy metal flag. "Bloodlust" is their third disc. Will have to investigate the first two. "Slaughter Prophecy" starts off strong. "The Immortal Curse" is one of the best songs the band has ever written and the vocals are some of the most diverse that Gerrit Mutz has ever belted out. The mix of deathly growls, the usual power metal singing and the gang vocals are quite compelling. Actually the entire album is musically some of the best the band has ever written. Unfortunately the lyrics leave a bit to be desired. Tales of heavy metal conquests, celebrations of pagan life and crushing Christianity are the themes of the day. Being a Christian myself, I was less than impressed to hear songs like "Crush the Holy" and "Faces of the AntiChrist." The whole "metal is our religion" thing is a bit silly but not quite as annoying as lines like "no second coming, no king of kings, I don't believe in salvation or sin, see I am metal and metal is me." To bad that Sacred Steel has to put such poor, cliché, demeaning lyrics to such great heavy metal. Cool cover art as well. The artwork looks very similar to the last Metallium CD.